It’s time to look at a recent book adaption. Unfortunately the book wasn’t good so an adaption was ultimately doomed to not be very good either. It’s a real shame since there are better books that we still need proper adaptions of like Daniel X. The film’s plot is just really weak, the characters aren’t likable or enjoyable, and the climax has a lot of plot hax. Yes, you have made it to the final Wrinkle in Time movie! The plot starts off with a little girl named Meg getting in another fight. Her Mom is worried since this has been happening a lot lately. Meg’s father vanished a while back and he probably isn’t coming back so now at school everyone messes with Meg about it. That’s when an alien breaks into the house and tells Meg that they can find her father. Meg’s brother Charles is cool with this and her friend Calvin is game as well. The alien transports them to another world and now they have to use the powers of friendship and hope to break reality and free her father. Can they do this? Keep in mind that the plot isn’t really the focus of the film. You can argue that it’s all just an abstract roundabout way of trying to get Meg to come to terms with her feelings. A big chunk of the film is about getting Meg to accept the unexplainable and to believe in the impossible like her father coming back. It’s an interesting moral since usually it’s more about letting go. Honestly this should have focused on the mother more as she knew about the dad’s experiments about teleportation and never did a thing to try and find him. Shouldn’t she have suspected the most what had really happened as opposed to just buying into his disappearance? Meanwhile the 3 aliens are extremely annoying and don’t contribute anything interesting to the film. For starters, they don’t know how to interact with humans which gets really grating right from the start. They constantly insult Meg (Okay, just the main one throws the insults, but the others express their doubts a lot) just like the bullies in the real world. Are these really the cosmic beings that we are supposed to root for? They don’t get any good scenes and throw Meg into this world with no context so of course she is having some trouble. They should be more concerned with how Charles is taking everything in stride. Charles was the worst character in the book and that hasn’t changed here. The film did a good job of reducing his scenes quite a bit which was great but at the end of the day nothing can really save his unfortunate ending. He’s very weak willed so the darkness can control him quite easily. It makes for a visually interesting climax where he gains telekinesis and super abilities but that makes him too strong. Meg is just a kid so keep that in mind and he has super powers. She literally has no chance of victory but even after getting thrown around the room multiple times to the point where she should have died, Charles is convinced to turn good again through the power of friendship. I think the climax should have been handled way differently. As it is Charles was less shady than in the book but either way the betrayal was a bit much. Then we have Calvin who is just annoying the whole time. He’s pretty much here just to try and add in a bit of romance. Spoiler alert, it doesn’t work very well. He adds absolutely nothing to the film and just seems unrealistic. He helps her self esteem a lot and seems like a nice kid, but of course he needs to have a sob story as well. Why can’t he just be a nice guy who isn’t trying to compensate for something? The romance doesn’t get much of a focus fortunately but you do have to question why it was around in the first place. The cast is rather small as the film is focusing on the visuals and not developing everyone. Unfortunately that means that every bad character really hurts the film and that is the case here. Lets make sure we have the record straight. We have Calvin who is a filler character. He’s not terrible, but he isn’t good. Then we have Charles who is a terrible character. The 3 Aliens are also super annoying. Meg isn’t very likable either as she is simply too mopey and constantly doubting herself. By the end of the film she finally gains confidence but it’s too late. We have the school personnel who are bad at their job like expected and then the bullies are added in as fluff. The Father is a poor character as well if you ask me. Maybe he shouldn’t be blamed for being powerless to escape his prison, but the guy just came across as really unprepared and had a tendency to give up easily. As you can see this film just really didn’t hit the right notes for me. Granted, its biggest offense for the most part is simply that it was very boring. It’s not as if it made huge mistakes that would make me give it a terrible score like a 2. It won’t be positive either though since I just can’t recommend a boring film either. The film just has no life in it or any real imagination either. It just feels soul less and never gets you engaged. It’s like a fantasy film without any good lore behind it. Overall, A Wrinkle In Time gets a hard pass from me. If you want to watch something that makes you feel like you’re watching a real film then check out something like Narnia instead. You will leave that film feeling a lot more fulfilled and it’ll probably age better as well. Perhaps a sequel to this film would work better now that the introductions are out of the way but it would still need a plot that is actually interesting to back it up so that may be a little too much for this series to handle as well. Still, with a sequel there is always hope I suppose. 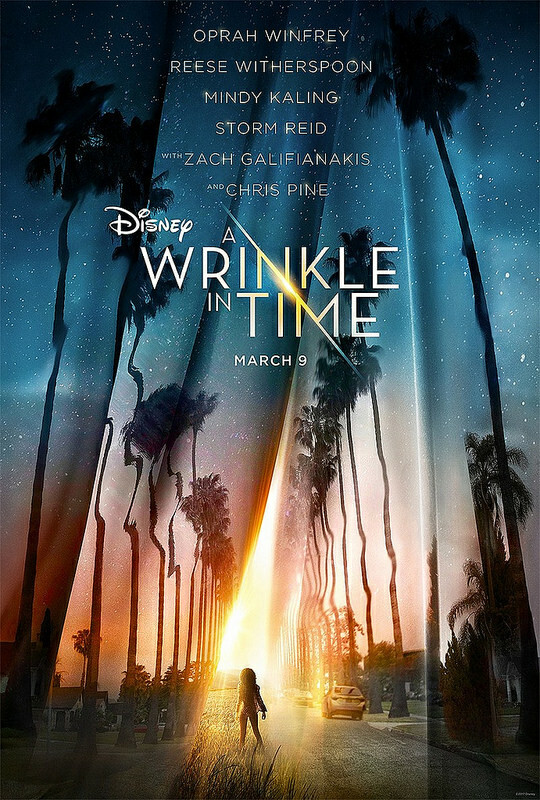 This entry was posted in Live Action Movie Reviews, Live Action Movies, Reviews and tagged A Wrinkle in Time, Book Adaption, Disney, Drama, Film Review, Movie Review, Review, Special Effects, Supernatural by dreager1. Bookmark the permalink.